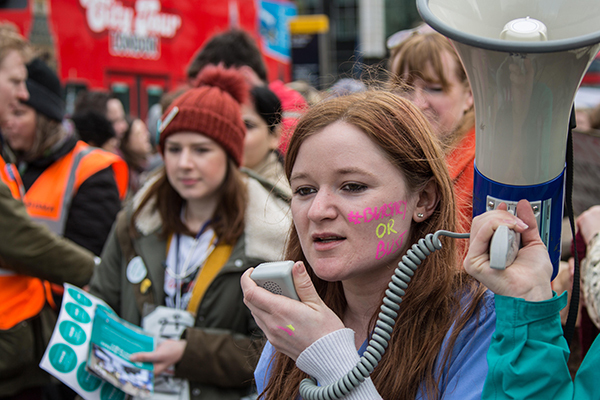 The campaign to save the bursary saw students take to the streets and social media to make their voices heard – an experience that may have helped their development as nurses. The former healthcare assistant, who rose to national prominence in the Bursary or Bust campaign, has also been involved in a wide variety of causes, including collecting aid for refugees in Calais. Her experience of addressing 150,000 people at the People’s Assembly National Demonstration, Health, Homes, Jobs and Education, in Trafalgar Square in March, empowered her nursing practice. 'I have more confidence in hospitals when speaking to patients and doctors now,' she says. But she also says there's more to being an activist than shouting through a megaphone. 'Being an activist is accessible on many different levels,' she explains. Kat Barber, a third year adult nursing student at Staffordshire University, used social media to rally support for the bursary. After she amassed more than 148,000 signatures for her petition – 100,000 is required to be considered for debate in Parliament – MPs discussed the issue in Parliament in January this year. Kat thinks nurses have been too reluctant to advocate change and inform debate on health issues and hopes that students who got involved in the bursary campaign will retain a taste for activism. Ms Tiplady advises students and qualified nurses to keep their activism separate from the workplace. She did not talk about her campaining on placements for fear of damaging her career. The government is pressing ahead with replacing the bursary with a loans system, but Ms Tiplady does not view the campaign as a failure. 'It has brought some fight into nursing which it needed,’ she says.